In 2003, Leon Dorleans, the senior pastor of the Christian Community Church of Cite Soleil, Haiti, approached FHM and described the lack of basic healthcare in the community of Blanchard, a small suburb of Port-au-Prince considered an extension of Cite Soleil. The community of Blanchard was one of Pastor Dorleans’ main concerns because several parishioners from his Cite Soleil church moved to Blanchard and asked him to organize a church, school and health clinic. Under the direction of Pastor Dorleans and his wife, Jacky Dorleans, the church and school opened and grew rapidly; however, the unmet need of access to affordable healthcare, health education and disease prevention still plagued the people of Blanchard. The residents have minimal access to acute care, sanitation, potable water, simple nutrition, family planning and immunizations. FHM partnered with Pastor Dorleans to oversee the health care program of the Blanchard facility. In March 2004, FHM hired the first Blanchard public health workers Napeau Chrisnel and Annaus Frankel. They began to survey the community to define the Blanchard geographical area map and collect demographic and health data on the residents of the community. This data was used to define community health needs and to determine priority health projects. Napeau would go on to become the clinic manager and Annaus the manager of FHM’s cervical cancer prevention clinic. Ten years later, both individuals are faithful FHM employees who continue to serve the Blanchard community. Construction of the FHM Blanchard Clinic took place in phases as funding became available. With support of several funding sources including Duke Chapel, the construction of the first floor of the Blanchard Clinic was completed in the summer of 2006. The clinic opened later that year and began to provide acute and preventive healthcare. The vision for this facility included a community public health effort which engaged families to promote health and prevent illness. In 2008 construction on the second floor was completed and the space is now used for the cervical cancer prevention program. 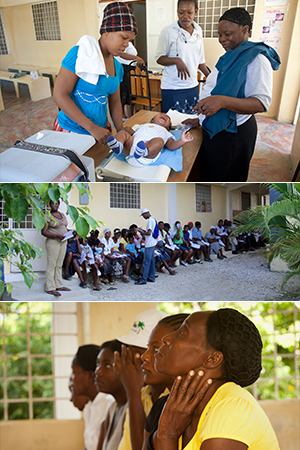 Currently, the FHM Blanchard Clinic employs 9 Haitian healthcare workers and is open Monday through Friday. The family health clinic on the first floor provides care to approximately 200 patients per month and the cervical cancer prevention clinic screens and treats another 100 women per month. The Blanchard Clinic offers healthcare for acute medical issues, follow-up care for chronic conditions, as well as public health research and healthcare training to improve overall health of the Blanchard community. Other services such as prenatal and well-baby care, preventive health services for adults including diabetes and high blood pressure care are also offered at the Blanchard Clinic.